When we moved to Pennsylvania in the early 2000s, we were a newly retired military family. For this first time in years, we were able to choose where we would live. That was exciting for us because it was a luxury we didn’t have as active-duty military when our older daughter was in school. We were forced to send her to whatever school was zoned for our military base. So, when we retired and had a choice, we picked a district with “great” schools. It turned out to be anything but. The strikes were devastating for our son, who suffers from a learning disability. What he needed most for his education was consistency. But the demands of the union kept him from this most basic need. Year after year the strikes continued, and year after year he fell further behind. We had to do something to help our son, because everyone else was failing him. Because of school choice, we found an online school that changed his life. No longer did we have to worry about teachers union strikes or inconsistency. We could count on our online school’s teachers and staff, and he thrived. He graduated from Connections Academy in 2015. Had we been forced to stay in a district ravaged by teacher strikes, he would not be where he is today — an honors student at Pikes Peak Community College. When unions force teachers to walk out of classrooms, students and families are held hostage in an ugly tug-of-war among adults — unions, school boards, and lawmakers — whose job is supposed to be to ensure a seamless education for children. As negotiating and dealmaking on behalf of the adults occurs in stairwells and hallways in state capitols, families and students have no recourse. 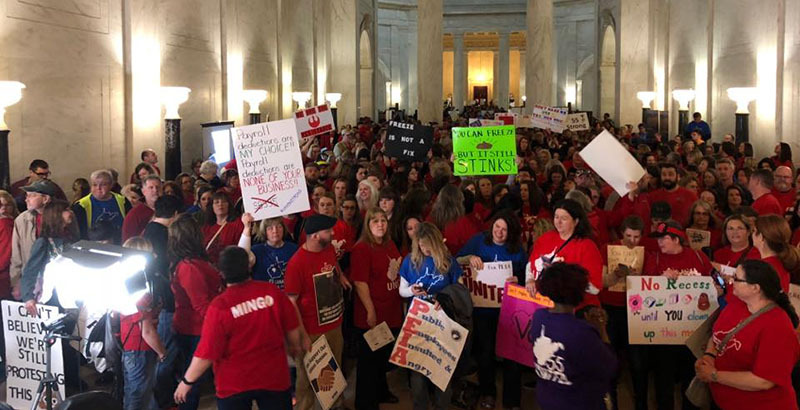 Parents across the country should see West Virginia as a harbinger. Unions in other states will be emboldened to do the same. Teachers unions in Oklahoma and Arizona are already threatening strikes. When the unions in Pennsylvania walked out on my son, we walked away because we had school choice. If it weren’t for choices, we would have been stuck in a school that wasn’t serving his needs because of union demands. If there was ever a time to make the case for expanded choices in education, it’s now. Parents need options so that when a school isn’t meeting their child’s needs — because of strikes or for any other reason — they have access to options that will work for them. School choice gives power to parents. If there is a silver lining to these strikes, perhaps it will be more parents exercising their right to find better options for their children. Tillie Elvrum, a longtime school choice advocate and parent, is president of the board of PublicSchoolOptions.org. Tillie Elvrum, a longtime school choice advocate and parent, is president of the board of the National Coalition for Public School Options.